The Indiscipline of Painting is an international group exhibition including works by forty-nine artists from the 1960s to now. Devised and elected by British painter Daniel Sturgis, it considers how the languages of abstraction have remained urgent, relevant and critical as they have been revisited and reinvented by subsequent generations of artists over the last 50 years. It goes on to demonstrate the way in which the history and legacy of abstract painting continues to inspire artists working today. The show brings together works by British, American and European artists made over the last five decades and features major new commissions and loans. 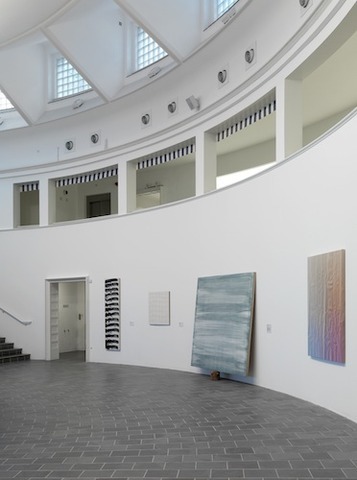 It includes important works by Andy Warhol, Frank Stella, Gerhard Richter and Bridget Riley alongside other lesser known artists such as Tomma Abts, Martin Barré, Mary Heilmann and Jeremy Moon. The Indiscipline of Painting is a collaborative project between Tate St Ives and Mead Gallery, Warwick Arts Centre.